A Royal Australian Air Force F/A-18 Hornet conducts a Close Air fly over. Image via Commonwealth of Australia, Department of Defence. Australia’s F/A-18 fighter aircraft will find a new home overseas, with a foreign government set to officially announce its intentions to buy the aircraft next week. Relations between Canada and US aerospace company Boeing have continued to deteriorate, with the Canadian government now walking away from plans to buy 18 Boeing Super Hornet fighters. Last year, Canada announced plans to buy 18 Super Hornets as an interim solution for replacing a subset of the CF-18 Hornet fleet due for retirement within five years. However, talks with Boeing over the planned acquisition were suspended by Canada after Boeing launched a trade challenge against Canadian plane-maker Bombardier in April, accusing the company of dumping its jet into the US market and claiming the company received unfair subsidies from the Canadian government. 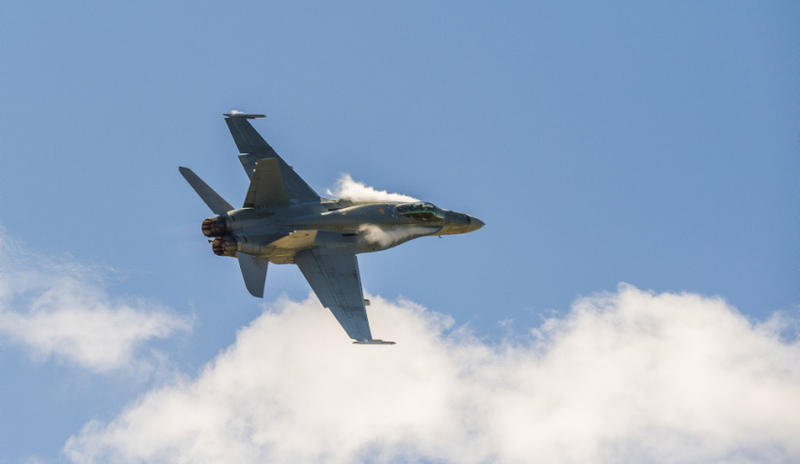 In late August this year, the Australian government and Canada began discussions to assess the potential purchase of F/A-18 fighter aircraft and associated parts the government plans to sell. The Canadian government then confirmed on 29 September it submitted an expression of interest, formally marking Canada’s interest in the Australian equipment. "Canada expects to receive a response by the end of this year that will provide details regarding the availability and cost of the aircraft and associated parts that Canada is considering," the Canadian government said in a statement. It is understood the Royal Canadian Air Force needs 28 to 30 used F/A-18 fighter jets to fulfil its international commitments to the North American Aerospace Defense Command (NORAD) and the North Atlantic Treaty Organization (NATO). Any maintenance and upgrades needed on the Hornets could be carried out by Canada's L3 MAS, which has previously carried out work on the Australian Hornets in 2012. Australia is replacing its fleet of 71 F/A-18A/B Hornets with 72 fifth-generation F-35A Lightning II aircraft from 2018 onwards.